Serious Question: If #UtilitiesKnew about Climate Change in the 70s, And Everyone Else Did Too, Why Are We Still Using Hashtags? In the beginning there was #ExxonKnew. Then there was #ShellKnew. And now we’ve just learned that #UtilitiesKnew, too. The anti-fossil fuel Energy and Policy Institute is out this week with a new report accusing electric utilities of knowing about climate change for decades, while somehow covering it up. Are we the only ones who have noticed that these are all the same activists making the same accusations? Apparently everyone knew about climate change – everyone except, you know, the actual environmental activists who were created to track this stuff in the first place. With a name as anodyne as Energy and Policy Institute (EPI), you might be surprised to learn how closely connected it is with all of the major activist groups that have pushed the #ExxonKnew story from the beginning, including the Union of Concerned Scientists and Greenpeace. The EPI report’s lead author, Dave Anderson, previously worked for the Union of Concerned Scientists, Sierra Club, and one of Al Gore’s pet projects. The group is also tied to the Center for Media and Democracy, another critic of hydrocarbon-derived energy. Though EPI is critical of groups that receive corporate funding, it does not disclose its own funders. This latest report comes out of the same tired playbook used by the #ExxonKnew campaign: Dust off some old documents publicly available to anyone who would want to look for them, suggest they’re top-secret anyway, and then characterize their contents as definitive proof that companies had reached definitive conclusions on climate change in the 60s and 70s, but then tried to hide them from the public. We’ve been down this road before and the argument doesn’t hold up, especially since the documents were easily accessible via the Google machine. If this were a conspiracy, you would think the first thing the conspirators would do is take the damn things off the internet. EPI says the electric industry was warned about climate change in 1968 when a science advisor to President Lyndon Johnson spoke to the annual convention of the Edison Electric Institute “about the threat that allowing CO2 emissions from burning fossil fuels to build up in the atmosphere could one day pose to the climate.” EPI alleges that this incident marked the first warning to the electric industry that CO2 emissions from fossil fuels could contribute to climate change. Ironically, it appears that the environmental activists were the only ones who didn’t know about the threat of climate change, judging by their reaction to these so-called revelations. But recall the world’s leading climate scientists were still decades away from outlining the certainty of impacts of global warming or global cooling. 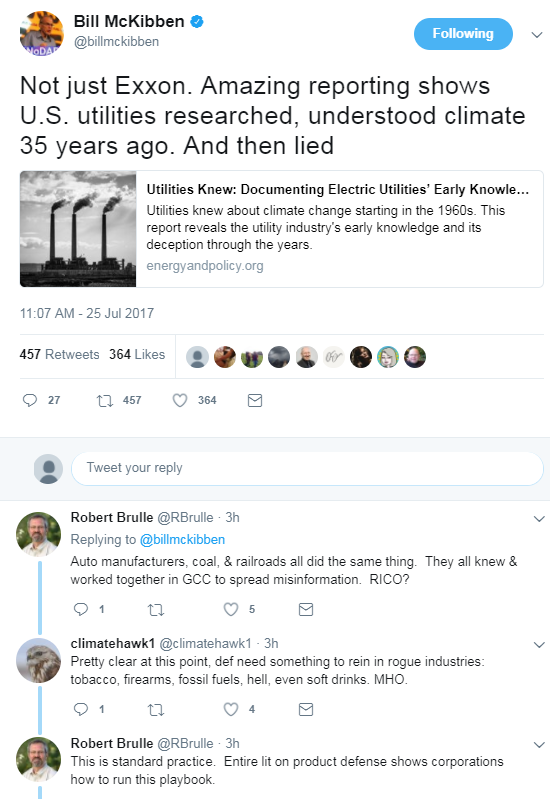 It’s also worth noting that several activists tied into the #ExxonKnew team were quick to pounce on the report, including 350.org’s Bill McKibben and Robert Brulle. Brulle authored a paper examining which think tanks received donations from the fossil fuel industry and would later be cited by Sen. Sheldon Whitehouse (D-RI) in an op-ed calling for the industry to be investigated by the federal government (yes, thought crimes are alive and well). Brulle and another activist name eight different industries that have supposedly gone “rogue” and need to be reined in, suggesting that they be investigated under RICO in an almost knee-jerk reaction. But what this latest stunt shows is that, apparently, everyone knew about climate change – and thus any claim of a “cover up” or “secrecy” is dubious, based on what the activists themselves are publishing. It further proves that the #ExxonKnew campaign and its various spinoffs are nothing more than political smear campaigns, designed entirely to attack people who disagree with them on global warming policy.